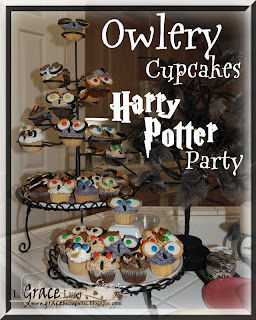 Welcome to yet another one of my Harry Potter Party posts, #10 I believe. For a complete list of current posts see the bottom of this one for more links. 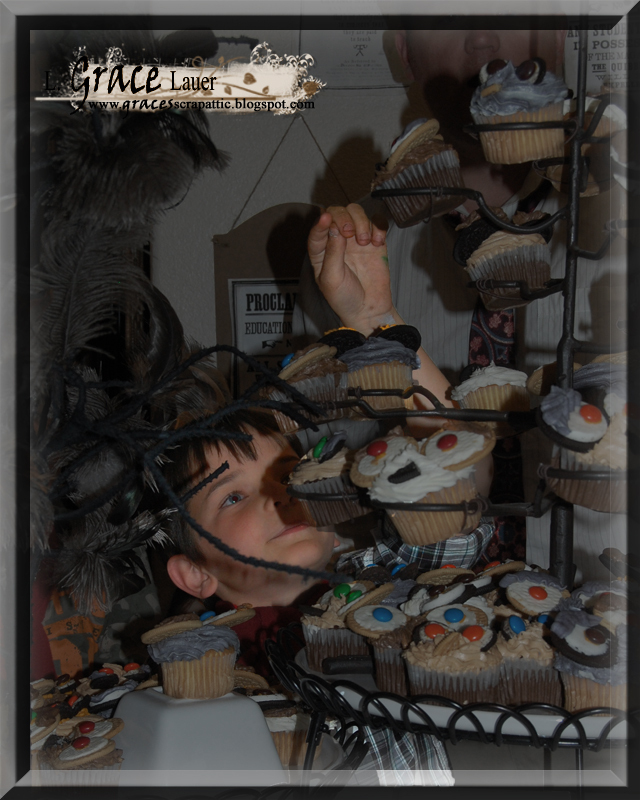 Today I am going to be showing you all these adorable cupcakes from our Owlery tower in honor of Hedwig. 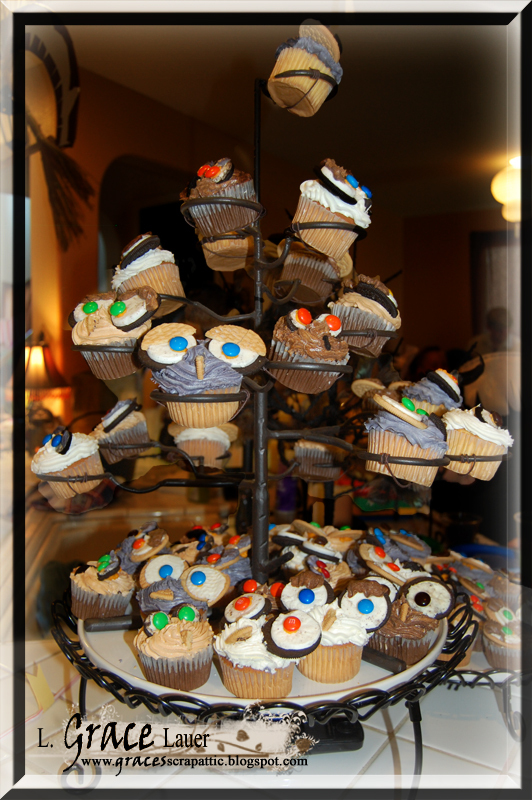 This tree like cupcake holder was found at a yard sale for a couple of dollars. It was a votive candle holder. I took out all the glasses and added some brown floral wire under each of the holder spots. This allowed the cupcakes not to slip through. My mother was so kind to put these together for me while I worked on the Golden Snitch Cake. Here she is putting on the M&M eye balls. 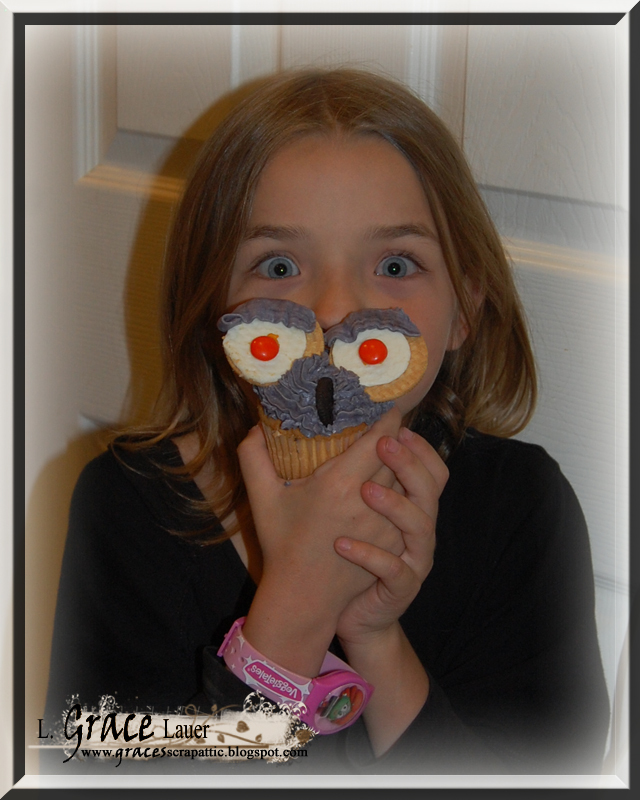 For a some up close photos of these adorable cupcakes please see Pure Delights Baking Co. Owl Cupcakes Post. Here is my son and then daughter picking out his and her cupcakes. So cute! 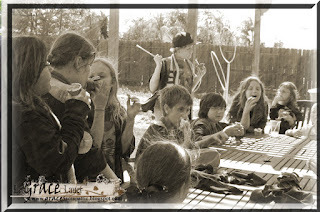 I hope you enjoyed this post, please leave a comment below and fallow this blog to ensure you see the rest of the updates and new party posts. Thank you for your time today. 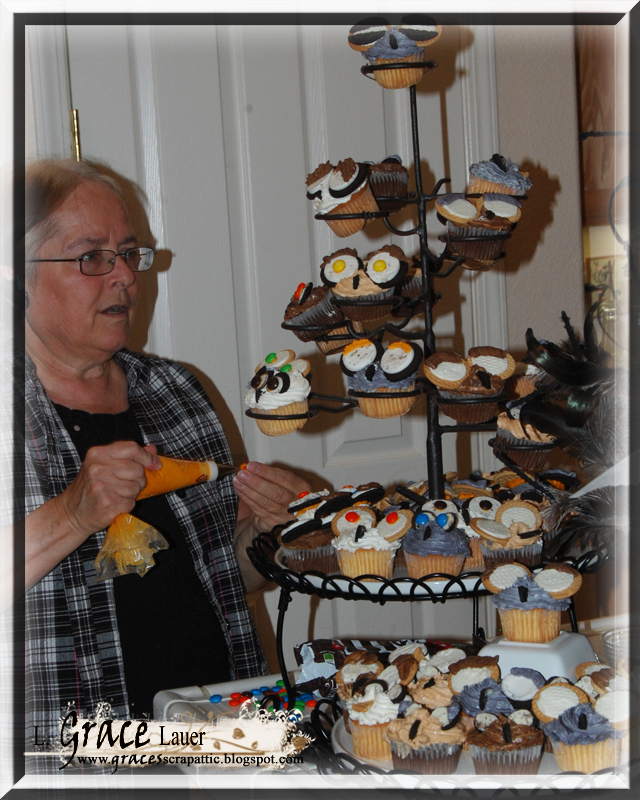 I am still working on all these Harry Potter Party photos and WOW! So many details I have to share. So here we are at our "Three broomsticks Inn" our one stop shop for snacks and spirits. 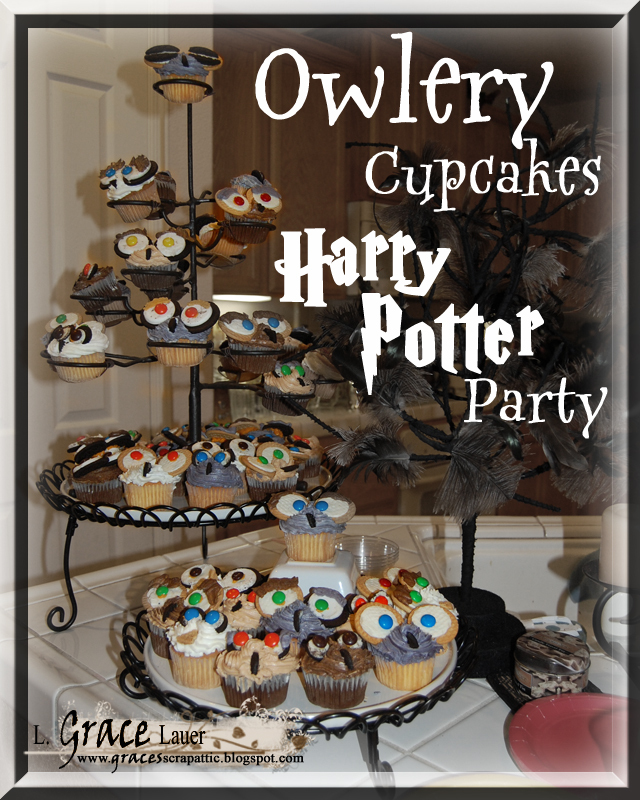 I have to admit I ran out of time for all those baked party goodies you see on other Harry Potter posts. So just some very cool and yummy drinks and store bought snacks here. 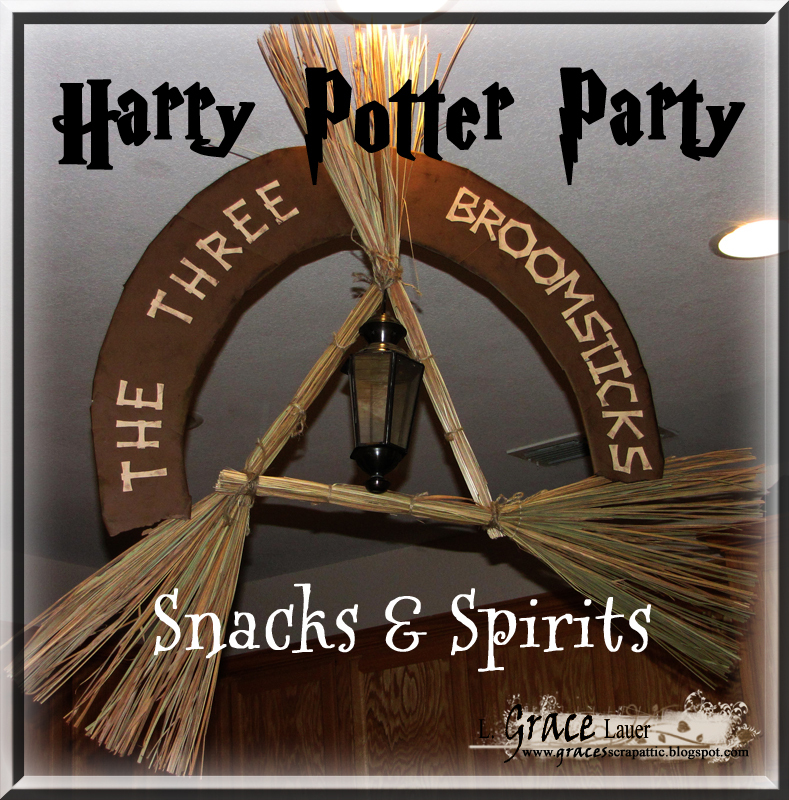 The sign up above was made with three $1 store decorative broomsticks. How I found these in the middle of May when they are usually a fall decor item is beyond me. LOL! The rest is a paper wrapped piece of cardboard, a candle lantern and some cricut letters cut with the "Life's a beach" cricut cartridge. All stuck together with Helmar Acid Free Glue. I found this amazing Butterbeer recipe through Pinterest. 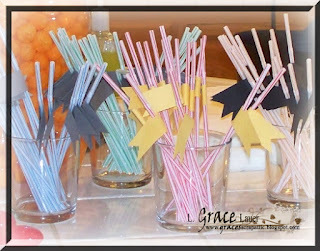 I contacted Colleen over at Just Sweet and Simple Blog and asked her if I could use some of her party images/projects in mine, she was there to answer any questions I had and was very helpful and allowed me to use some of her ideas and files. Thanks Colleen!. I have to admit she was a great inspiration to me. 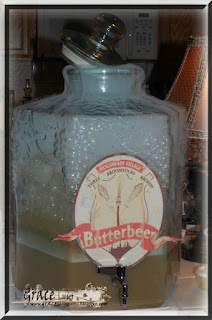 Her Blog post called "Harry Potter Party" is where I got this recipe for the Butterbeer. The Polly Juice Potion Punch though was re-created from one of our favorite party punch recipes. Last year it was called Yoda Soda for our Lego Star Wars Party. 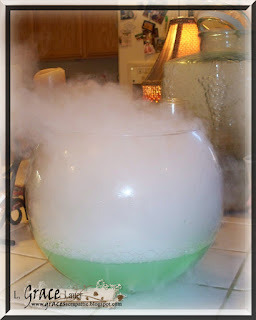 Oh and this year we added dry ice... LOL! That's it! Kids from school talk about this forever! 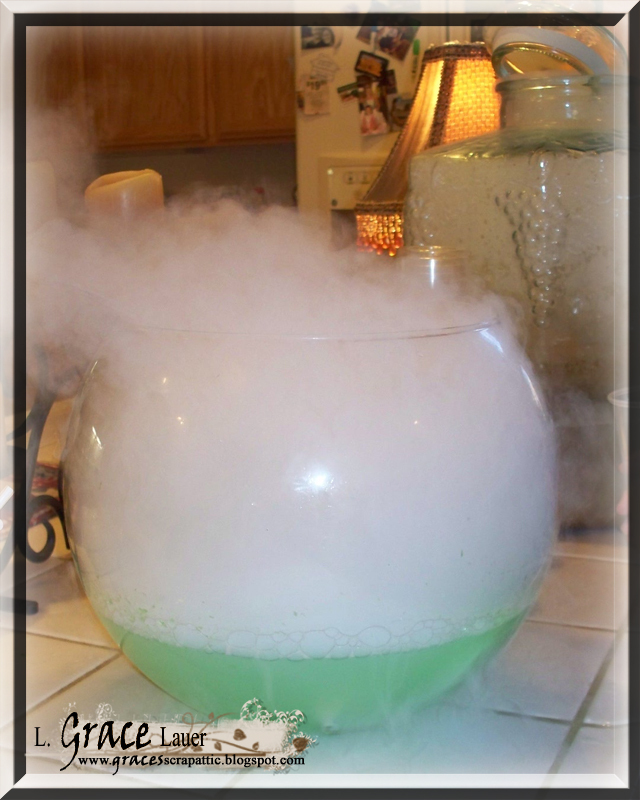 We had them ask my son a few times if I was going to make the Yoda Soda again for the Harry Potter party. 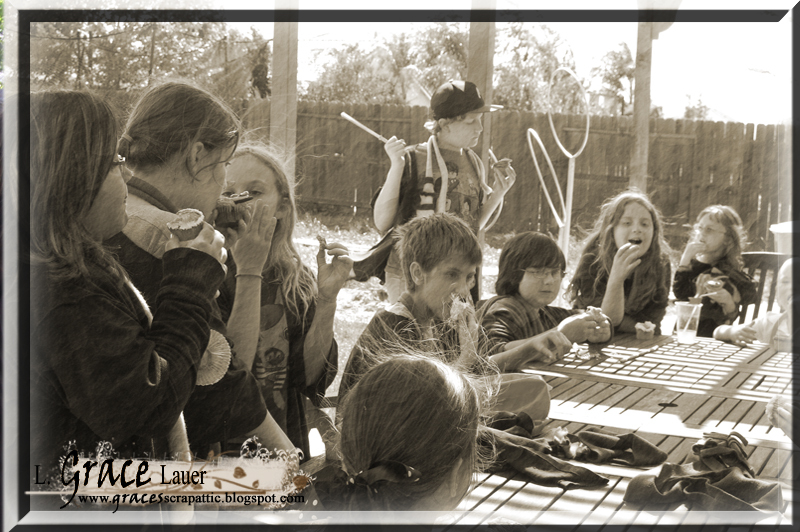 Man that was a fun party too.. and those light saber invitations... WHEW! I am getting sidetracked. I have been hunting and gathering for a couple of months now and thanks to some locals I found all these mugs and glasses for our party for really cheap. These are the Butterbeer mugs and Polly Juice pilsners in the back..
We Made Harry Potter House straws. They are the colors and flags of the houses in the stories. With the paper flags the kids could write their names on them to know who's glass each one was. They were put together with cardstock and Helmar 450 Quick Dry Glue. 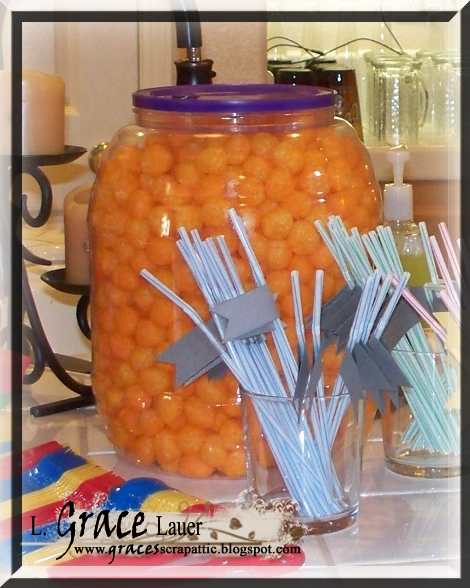 We had a ton of candy, cake and cupcakes so we didn't have to many other snacks but per my son's request, cheese balls were on the menu as "golden snitch puffs". Next I will post about the Golden Snitch Cake and the Owlery Cupcakes! For more of the Harry Potter party please see the links below. Thanks for your time and please leave a comment below to tell me how you like our party. Don't forget to fallow my blog for more fun party, costume, home decor and many other project ideas. 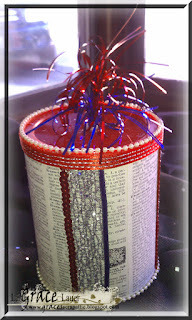 Welcome everyone to the second stop to the Helmar Red, White & Blue Blog Hop! Why Red, White and Blue? Well our Design team is made up of three wonderful countries dawning these colors; Australia, Canada (shy the blue) and America. 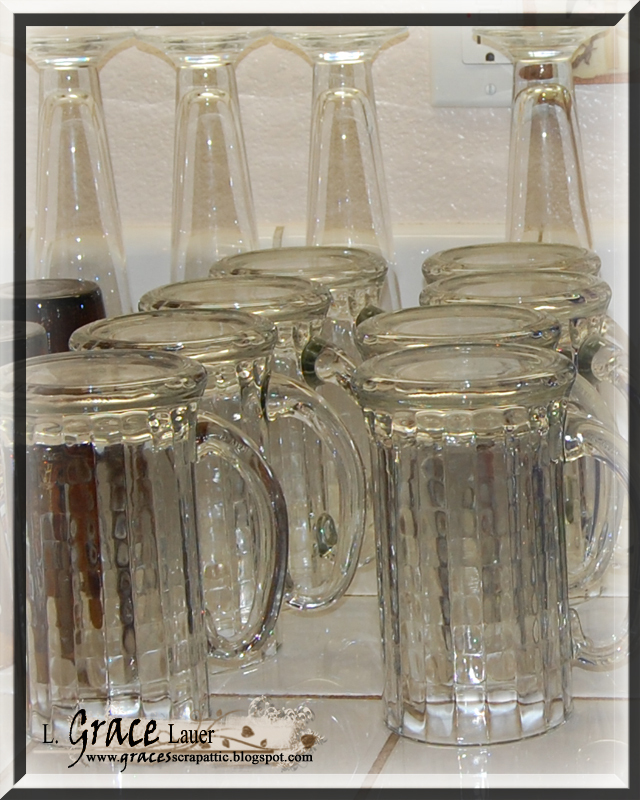 So grab a glass of your favorite beverage and lets get hopping. You should be coming from Helmar's Blog (the start of the hop) please feel free to fallow my blog or Tweet, FB share or Pinterest share this project. Your next stop on this hop is listed at the bottom of this post. I am so glad you have stopped by, I have a fun project I think you will love. 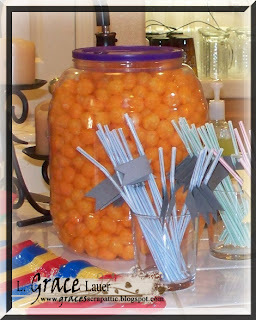 Taking some inspiration from Katy Perry... LOL! This song gets me every time with the video. Here I go Decorating on a Dollar again! 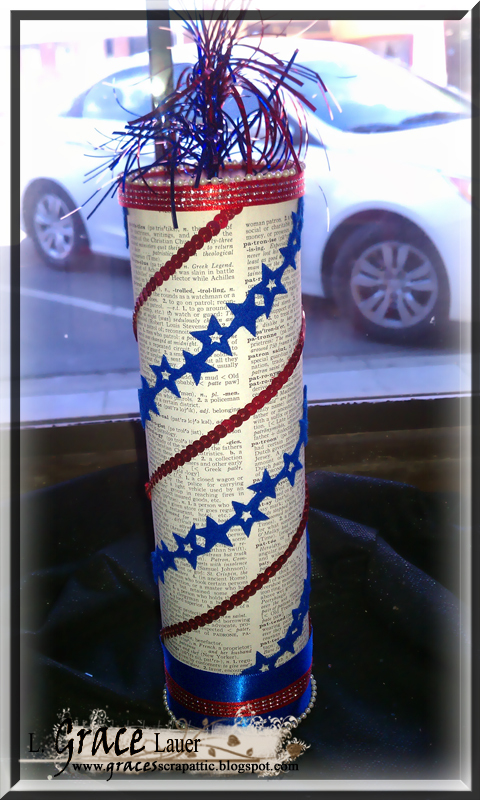 Cans of "trash" and old book pages... left over ribbon scraps and some glue. LOL! 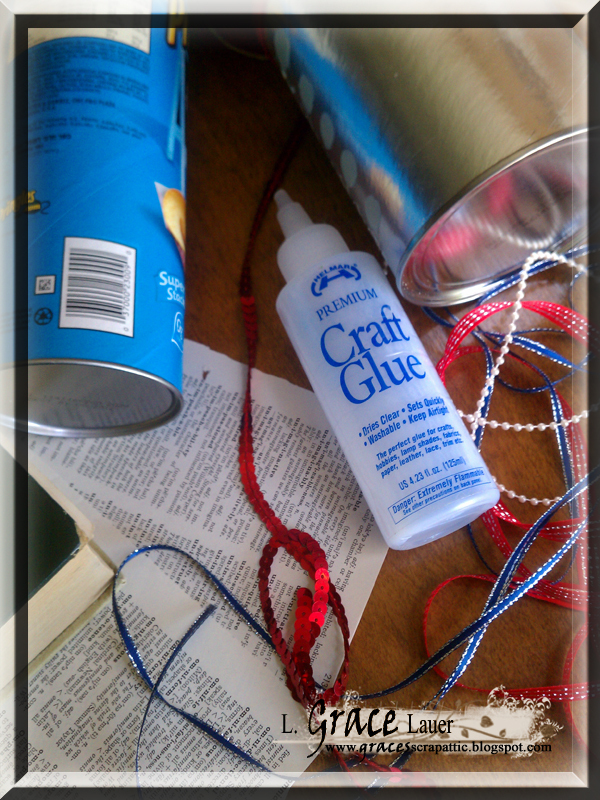 First choose your containers, tear out some old dictionary pages (I chose ones that had words like "Liberty", "United" and "Patriotic") Get some Red, White and Blue ribbon and paint out of your stash and start creating some Helmarific Fireworks! 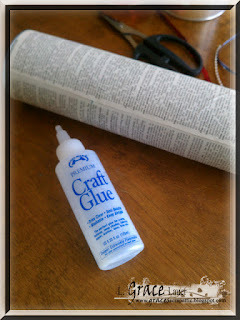 Helmar's Craft Glue did the job with a thin layer of this stuff zigzagged across the outside of this Pringles Can, I quickly adhered the dictionary page that was per-measured and cut to fit. Using Helmar's Craft Glue I adhered the rest of the embellishments as well. 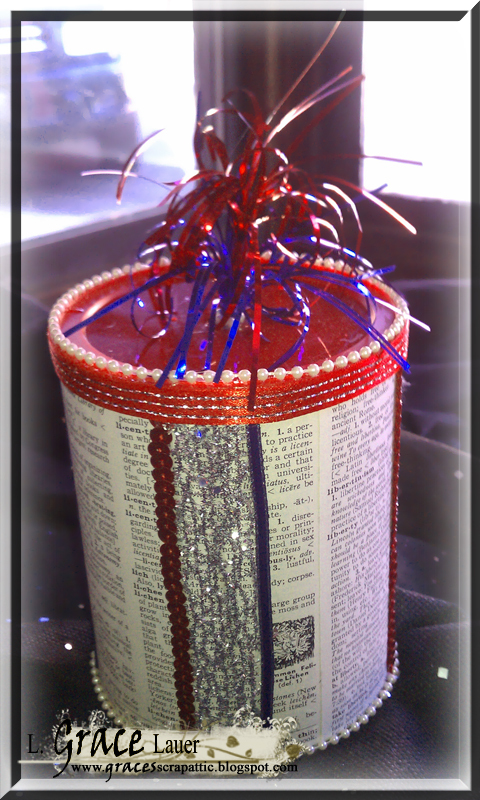 I used a wooden skewer to create that lit fuse look on the top with some foil tissue paper and shredding scissors. I glued that through a hole I punched with my Crop-a-dile. This is the final project for the hanging fire work. I made this one the same way but the Pringles can is upside down (I didn't have a lid for this one so the streams of torn fabric are glued into the inside of the can (I scratched it up so the glue would have some cardboard to stick to) with Helmar's Craft Glue. Using my Big Bite Crop-a-dile I punched a whole in the side and ran ribbon through it tying a washer to the inside so it would not slip through. Here is a shorter, rounder firecracker I created for this set. It is made from a Slimfast can. Thank you so much for you time this morning, have fun on the rest of the blog hop and fallow me for more great projects and Helmar fun. Your next stop is the fabulous Michelle Wallace - The art of Scrapbooking! If you get lost along the way, you will find the order below. Make sure you leave your comments on every stop for your chance to win. 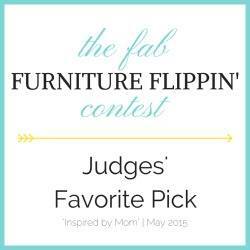 We will select 1 Canadian, 1 American, and 1 Australian individual. So that is 3 prizes total. Now lets get hopping. To win the prize for your country you must leave a comment below to enter, don't forget to like this blog also for future projects and more Helmar fun! 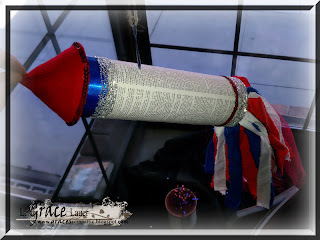 Thank you for spending your time today with us and Helmar... hop on to Michelle Wallace - The art of Scrapbooking for the next patriotic inspired Helmarific project!